Organizations increasingly require IT infrastructures that support the speed at which their businesses must operate through simplicity, efficiencies, agility, and strong performance. Hyperconverged infrastructure solutions, which enable organizations to minimize or nearly eliminate inefficiencies and complexity associated with maintaining storage and compute silos, have emerged as a strong potential solution for such organizations. 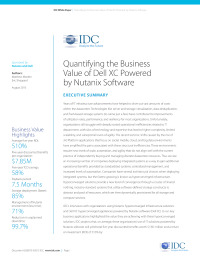 Download this white paper as it explores IDC’s research demonstrating that organizations running workloads on Nutanix solutions such as Dell XC are benefiting from cost and staff efficiencies, the ability to scale their infrastructure incrementally, very high resiliency, and strong application performance.